Jobs that require a great deal of standing, lifting, or moving around can, over time, place a great deal of stress on a worker’s knees. Inflammation of the tendons or small sacs of fluid that lubricate the knee can make it difficult to perform regular job functions that place pressure on the knee. Likewise, dislocations and tears of the meniscus can result in months of short-term disability. Unfortunately, employers are not always willing to provide injured workers with the compensation they need and are entitled to. At the personal injury law office of The Orlow Firm, our attorneys work with knee injury specialists and physical therapists in establishing the scope and nature of our client’s work-related knee injury. If you’re suffering from a work-related knee injury, contact the NYC personal injury lawyers at the law office of The Orlow Firm today to schedule a free consultation to learn how we can help you. Employers are responsible for complying with applicable OSHA and New York specific safety standards. When employers are negligent ensuring the safety of the workplace, they can be held liable for injuries that result. Since it’s not unheard of for employers to deny wrongdoing in cases involving knee injuries and workplace accidents, our attorneys are prepared to work with investigators and safety experts in exposing negligence on the part of companies that fail to comply with safety requirements. Our office has represented numerous injured workers in cases ranging from construction accidents to carpal tunnel syndrome. If your employer is uncooperative or has told you you’ll have to take your own vacation time or apply for FMLA to recover from a knee injury, we can help. 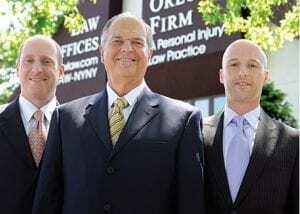 To schedule a free consultation, contact the NYC knee injury attorneys at The Orlow Firm today by calling (646) 647-3398.